A one-of-a-kind musical experience two centuries in the making, and a cross-cultural celebration of the bicentennial of New York’s Erie Canal. HANDEL: Selections from "Water Music"
AMERICAN FAVORITES, including “Stars and Stripes” and more! 9:30PM: FIREWORKS OVER THE "FLIGHT OF FIVE"
vocally assured, dramatically subtle and compelling, and artistically imaginative” (Washington Post), noted for her “powerful, clear voice” (New York Times) and “revelatory, sensual, smoky readings” (Opera News) is one of the most diverse and compelling vocal artists on the scene today. The Golden Eagle String Band has been performing in the Northeastern U.S. since 1978. The band has recorded for Smithsonian/Folkways, toured under a grant from the National Endowment for the Arts, and received a gold medal from the Smithsonian Institute as Folkways recording artists. Merge onto I-787 S. Take the I-87 exit, EXIT 1. Take the I-87 N exit, EXIT 24-61, toward Montreal/Buffalo. Merge onto New York Trwy N(Portions toll). Merge onto I-490 W via EXIT 45toward Rochester (Portions toll). Merge onto NY-531 W/Spencerport Expy W via EXIT 8 toward Spencerport/Brockport. Take Washington St/NY-36 toward Brockport. Take the 1st left onto Brockport Spencerport Rd/NY-31. Turn right onto Lake Rd S/NY-19. Continue to follow NY-19. Turn right onto Water St.
Brockport Welcome Ctr, 11 Water St, Brockport, NY, 11 WATER ST is on the left. Lauded by the New York Times as plush, elusive and alluring, and vivid and colorful by the Albany Times-Union, the music of Loren Loiacono (b. 1989) has been heard at Carnegie Hall, Merkin Hall, Minneapolis's Orchestra Hall and on WQXR and WSHU. She has received awards including ASCAP's Morton Gould Award, Minnesota Orchestra Composers Institute, and the National Foundation for the Advancement of the Arts, among others. Founded in 1820, Brockport grew to become an important port on the Erie Canal and for a short time was the official end of the canal.In 2009, Brockport earned the Erie Canalway Heritage Award after an extensive canal front revitalization. The Brigadiers Drum & Bugle Corps is a precision musical/marching organization that is historically significant to the Central New York region. FREE parking is available in a large lot across the street for both cars and motorcycles. Merge onto I-787 S. Take the I-87 exit, EXIT 1. Take the I-87 N exit, EXIT 24-61, toward Buffalo. Merge onto New York Trwy N(Portions toll). Merge onto NY-690 N via EXIT 39 toward Baldwinsville. Take the Van Buren Rd exit. Turn right onto Van Buren Rd/County Hwy-159. Turn left onto Maple Rd/NY-48. Continue to follow NY-48. Turn left onto Spensieri Ave. Paper Mill Island Amphitheater, You have arrived at your destination. Balancing the extremes of the familiar and the experimental, music by Ryan Chase (b. 1987) has been described as "the stuff of memory" (The Herald-Times) and hailed by the New York Times as a "whirlwind of deftly explored contrasts of mood, from bombastic to introverted." Though sonically diverse, his body of work is unified by a fascination with virtuosity and an affirmation of melody. The Syracuse Pops Chorus consists of about 100 skilled volunteers who sing for the joy of it. Founded in 2004, the Syracuse Pops Chorusregularly performs with the Symphoria Orchestra and with other arts organizations in Central New York. Baldwinsville's history as a canal community predates the Erie Canal by almost a decade. In 1839 the Baldwin Canal would officially connect with the Erie Canal making it easier and cheaper for Agricultural businesses in the region to ship and distribute their goods. A UNIQUE MUSICAL EXPERIENCE 200 YEARS IN THE MAKING... CONCERT STARTS AT 8PM. Due to unsafe conditions along the Erie Canal and significant flooding at Rotary Park in Little Falls, the Albany Symphony's Water Music NY performance has been moved to the rain location at Little Falls High School. Public artists, street performers around CanalPlace. CanalPlace is a group of historic Canal buildings that have been refurbished and now house a variety of unique antique shoppes, eateries & more. Plentiful free street parking throughout Canal Place (no lots or garages). Take the Thruway to Exit 30. Once through the tollbooths, go left over the river, and left again onto Route 5S heading east. Some six miles along Route 5S, take a left onto Route 167 North into Little Falls. A bridge crosses the river; at the stop sign, turn right towards Canal Place. Alternatively, continue on the Thruway to Exit 29A–both routes take about the same time. Take the Thruway to Exit 29A. Follow the road down to the river and along to the bridge. Follow Route 169 North into Little Falls along East Main Street. Route 5 West is an alternative to the Thruway and goes right through Little Falls. Route 5S is another option. Follow 167 (if coming from the west) or 169 (from the east) to reach Little Falls. Routes 12 and 28 converge. Take Route 28 South, via Middleville and Herkimer to Route 5 East. Take the Northway, I-87, south to Saratoga Springs, Exit 14. Follow Union Avenue West (Route 9P), then Route 29 to Route 67 West. Route 67 West joins Route 5 West, which goes through Little Falls. Take I-88 to Route 28 North through Richfield Springs and down the long hill into Mohawk. Turn right onto Route 5S East. Remain on Route 5S for about six miles, then turn left onto Route 167 North into Little Falls. Described as "Brilliant, humorous, and rhythmically complex," (Tacoma Symphony Blog) Ben Wallace is a composer, percussionist, and keyboard player hailing from Albuquerque, New Mexico. Ben's music spans a wide range of styles from chamber and orchestral, to disco and samba, and occasionally into the video game remix world. Mohawk Valley Choral Society was founded in 1982 and has been bringing exciting classical and light classical vocal music to the Central New York area for over thirty years. Its original goal was and continues to be: to bring skillfully performed choral music to the Western Mohawk Valley audiences as well as to provide area professional and amateur singers with an opportunity to perform major choral works with orchestra. Situated in a deep gorge of the Mohawk River Valley, the original Erie Canal flowed through the city and allowed Little Falls to grow and prosper. Today, the Erie Canal is a significant feature of Little Falls and is home to Lock 17, one of the world's tallest lift locks. Alex Torres & His Latin Orchestra bring their original blend of Afro-Caribbean rhythms such as Salsa, Merengue, Cha-cha, Bomba, Plena and Latin Jazz to Water Music NY in Amsterdam. 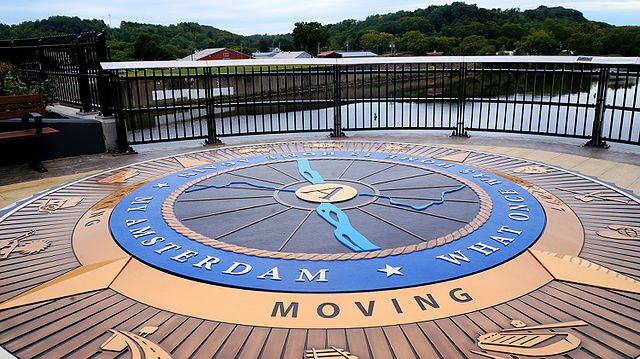 Take a leisurely stroll over the Mohawk Valley Gateway Overlook, a unique park over the Mohawk River. FREE EVENT PARKING IS AVAILABLE. The Parking Garage is located near the United Presbyterian Church. 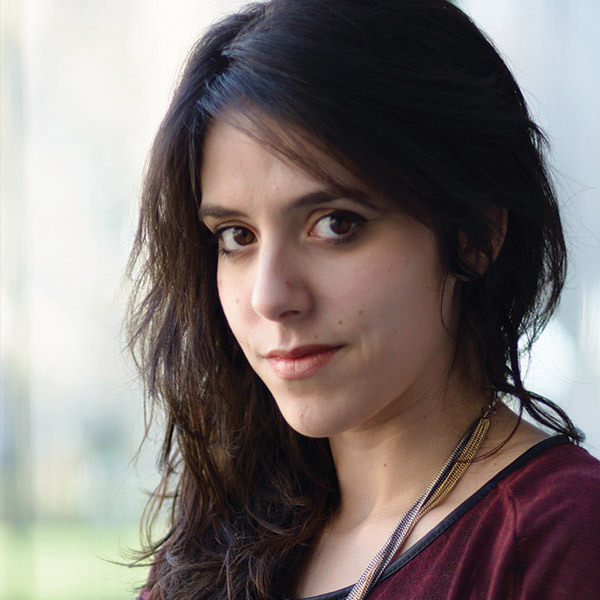 Puerto Rican-born composer and multi-instrumentalist Angélica Negrón writes music for accordions, robotic instruments, toys and electronics as well as chamber ensembles and orchestras. Her music has been described as “wistfully idiosyncratic and contemplative” (WQXR/Q2) and “mesmerizing and affecting” (Feast of Music) while The New York Times noted her “capacity to surprise” and her “quirky approach to scoring”. Mohawk Valley Chorus, in one form or another, has been entertaining audiences around the Amsterdam area since 1935, when Mohasco, then known as the Mohawk Carpet Mills and headquartered in Amsterdam, formed a men’s Glee Club. John A. Gillies was the first director. Six years later, the company added a Ladies Choral Club, directed by Reginald Harris. The two groups combined in 1948. Sponsored by the Mohawk Valley Chorus, MVC Kids is a community choral group for children, ages 6-12. Directed by Theresa Jackson, MVC Kids host annual concerts in Amsterdam, NY. In addition, The Mohawk Valley Chorus also sponsors the MVC Youth Chorale, a 15-voice choir for high school students living in Amsterdam, NY and surrounding counties. The Erie Canal transformed small Upstate communities into booming cosmopolitan cities. At the completion of the Erie Canal, Amsterdam grew into an important manufacturing center with factories that provided meaningful work that attracted immigrants from around the world. From Albany and East- Take NYS Thruway (I-90 West) towards Buffalo to Exit 25 (Schenectady). Take I-890 towards Scotia to Exit 1A (Route 5S). From Amsterdam and West- Take NYS Thruway (I-90 East) towards NYC to Exit 26 toward Rotterdam Junction. Take Exit 1A to Route 5S. The Farm is 2.7 miles on your right. FREE On-site parking is available. Annika Socolofsky (1990, Edinburgh) is a composer, avant-folk vocalist, and fiddler. Her music stems from the timbral nuance and inwards resonance of the human voice, and is communicated through mediums ranging from orchestral works to unaccompanied folk ballads. Annika is a recipient of a 2014 Fromm Foundation Commission and a BMI Student Composer Award. She is a Mark Nelson Doctoral Fellow in composition at Princeton University. Capital Repertory Theatre has a rich, local history of excellent entertainment and strong community relationships. Established in 1981, it came into existence through the dedication and perseverance of a group of Albany business, community and civic leaders. Donated labor, materials and expertise transformed the Grand Cash Market, an abandoned supermarket at 111 North Pearl Street, into what was to become the home of Albany's first professional resident theatre. When "Clinton's Ditch" opened in 1825, Schenectady officials opted to not celebrate its Grand Opening out of fear it would take away business from their profitable ports along the Mohawk River. The Erie Canal later helped Schenectady earn the reputation of being "the city that lights and hauls the world." BRING YOUR OWN CAMP CHAIR & BLANKETS! George Ward, New York's most beloved folksinger and Balladeer, celebrates the Erie Canal with a performance of traditional folk songs including "Fifteen Miles on the Erie Canal," "Oh! That Low Bridge," and "The Meeting of the Waters." On ramp, get into left lane and at the light at the end of the ramp, turn left onto Broadway. Keep right at fork in ramp. FREE event parking is available courtesy of the Albany Parking Authority. We recommend parking in Riverfront Garage (24 hrs) and Quackenbush Garage (6pm to 12am). Theatricality remains integral to Daniel’s work. Most recently, Daniel collaborated with playwright Kate Tarker and director Dustin Wills in creating Awful Event! Or the Assassination of Abraham Lincoln as Interpreted by the Unseen Internal Organs of His Wife, which premiered at Ars Nova’s ANT Fest in June 2016. Daniel is a 2014 recipient of the Charles Ives Scholarship from the American Academy of Arts and Letters and has been awarded two ASCAP Morton Gould Young Composer Awards. The Empire State Youth Jazz Ensemble formed in 1986, is ESYO's premiere Jazz Ensemble and has worked with guest artists such as “Blue” Lou Marini and Allen Vizzutti, and Grammy-award winning pianist/composer Bill Cunliffe. Founded in 2014, the annual Storytellers’ Institute sponsored by the John B. Moore Documentary Studies Collaborative (MDOCS) is a five-week residency hosted at Skidmore College. For the month of June, the Institute welcomes its Fellows to work on independent projects and engage in an annual theme. On April 15, 1817 the New York State Legislature voted to approve construction of the Erie Canal. For over 100 years all boats entered and exited the canal through Lock 1 in Albany.